Omar Ahmad was the main man for Carlton on Saturday as they blew away the challenge of RH Corstorphine at Grange Loan and kept up their impressive start to the CSL Eastern Premiership season. With a number of key men, including skipper Gordon Drummond, missing on the opening day the Capital had managed to go away to last year’s runners-up Arbroath and come back with a hard fought victory. And with the likes of Drummond, teenage prospect Chayank Gosain and consistent bowler Ahmad back in the XI they simply steamrollered RH Corstorphine in week two. 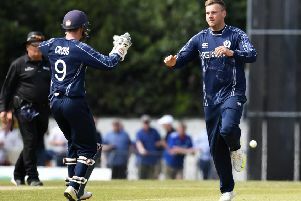 Having won the toss, Scotland World Cup man Ali Evans and overseas amateur Ryan McCloy opened the bowling for Carlton. They put the batsmen under pressure from ball one, but Michael Yellowlees and Ozzie Malik stood firm until the former fell to McCloy with wicketkeeper Steve Allen taking the catch. That was 28-1 and it was soon 30-2 when Australian pro Jake Marnie was out for a duck to the same McCloy-Allen combination. Evans then got his first wicket and when Hamish Gardiner took a very sharp slip catch off the bowling of McCloy to see Malik out for nine, the visitors were in real bother at 33-4. Ahmad took his first wicket of the season in his first over when Gordon Lamb spooned a catch to Steve Gilmour. The very next ball Ahmad bowled skipper Pete Steindl. He did not manage to get the hat-trick, Sulie Malik seeing the ball off safely, but soon he was gone for 0 and overseas amateur Daniel Payne was also back in the pavilion for nine. Ahmad and Tom Freshwater then cleaned up the tail and RH Corstorphine were 59 all out, Ahmad taking 5-4 including four maidens. In Carlton’s reply they were not in any mood to hang around on a cold afternoon, taking just 12 overs to reach their target. Greg Gilbert did take the wicket of Allen for six, but Gardiner’s flying start to the summer continued with 41 not out as Carlton won by nine wickets. The result leaves them top of the table while Mazars Grange are in third after two wins from two themselves. At the weekend they took on Arbroath at Portgower Place and George Munsey continued his good batting form from his trial at Nottinghamshire last week. Left hander opener Munsey made 107 and was well supported by Neil McCallum (62), vice-captain Ryan Flannigan (46) and Tom Sole (43) as they posted a daunting 293-7 batting first. Ross McLean did his best to take the challenge to Grange in response, hitting 93, but spinner Arun Pillai got his wicket. Captain Andrew Brock also took four scalps as Grange won by 61 runs. Heriot’s are fifth after their first win of the season against Stoneywood-Dyce. Sean Weeraratna and Kevin McLaren both hit half centuries at Goldenacre as Heriot’s made 284-8. Skipper Keith Morton then took five wickets and fellow spinner Mark Watt three as the visitors were bowled out for 139. Watsonians are still looking for their first win after a two wicket loss to Falkland. Batting first, Mike Carson top scored with 31 as ’Sonians made 145. Brendan O’Connell then took four wickets to put Falkland’s reply under pressure, but they got home at Myreside. In the Baillie Gifford ESCA Championship Ali Shah made sure the weekend just got better and better for Carlton. He scored 114 not out for Carlton II batting fist at Arboretum as they made 273-8 against Holy Cross. Three wickets from Carlton II skipper Rob Thornton helped Carlton II secure a 44 run victory. SMRH defeated Murrayfield DAFS by seven wickets.